Longtime readers might recall the story of Amos Hertzler, an Amish boy in Cattaraugus County, NY who was born with a serious esophageal condition in addition to having Down Syndrome. We first heard of this case in 2011 when Amos was just a one-year-old. Amos hasn’t appeared in the news much lately from what I’ve been able to find, which you’d assume to be a good sign. But apparently he was back in the hospital recently and the family has about $150,000 worth of outstanding medical bills. 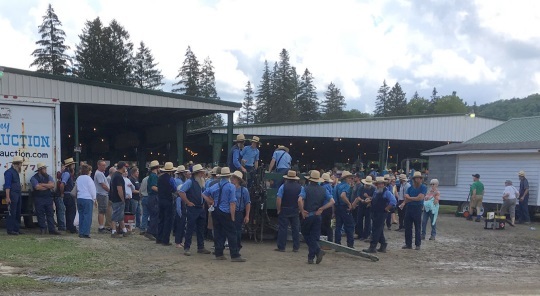 The auctioneers kicked off the auction at 10 a.m. Two auctioneers and staff were under one of the horse barns. A third auctioneer moved from place to place including a livestock auction. Barefoot children dressed in blues, greens and browns ran around the fairgrounds dotted with puddles left over from a downpour that started at about 7:30 a.m. and caught many people unaware — especially a barbecue stand on the racetrack. They quickly recovered however, and erected tarps over the stand where chicken, two whole pigs and hams were slow cooking on spits since 5 p.m. Friday. Each Amish man and boy wore a straw hat with a black band around it and the women and girls wore dresses with long sleeves and bonnets. Breakfasts of pancakes and sausage greeted those arriving early. Coffee and fresh-made doughnuts kept many visitors going throughout the morning. There was also pizza from five wood-fired ovens, chicken barbecue, pulled pork sandwiches, fish sandwiches and more. On the other end of the barn, homemade ice cream — vanilla and chocolate — was being scooped out of metal tubs as quickly as three gas-fired engines could turn it in a bed of ice. In addition to the auctions the community has held pancake breakfasts to help defray the high costs of Amos’ care (the Amish do not carry commercial health insurance), such as this 2014 event, or this 2012 breakfast attended and photographed by reader Tom. There are not a lot of details in the article about Amos’ current state, other than a mention that he recently underwent successful surgery in Boston. This would not be the first time he was treated there, as he spent 15 months in a Boston hospital in 2012-2013. It’s inspiring to see how far the Amish community will go to try to help improve the life of one of their weakest members. Amish normally handle health care costs among themselves, but the community decided to go public with Amos’ plight when faced with the high costs of treatment for Amos’ rare condition. For a more traditional group like the community in question, this had to be an unusual step but one they obviously felt was necessary given the costly treatment and long hospital stays involved. All best to Amos and his family and community. Where can I send a check to help this child? Karla, nice that you’d like to help. There’s no info on that in this latest article, but at least at one time, there was a donation account set up. 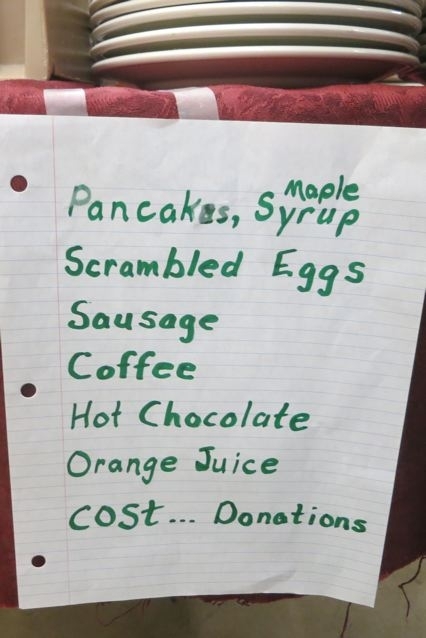 And I would suspect there must still be something active for people to donate. Why don’t the Amish self-insure, using a commercial underwriter? Just wondering…I often see commercials from St. Jude’s hospital, saying no child/family is turned away for inability to pay—care is free. Do the Amish ever avail themselves of such “help” from the “English” world? Maybe not Swartentrubers, but the more “liberal” Amish districts? If not, why not? Like I said, I’m just wondering/curious.